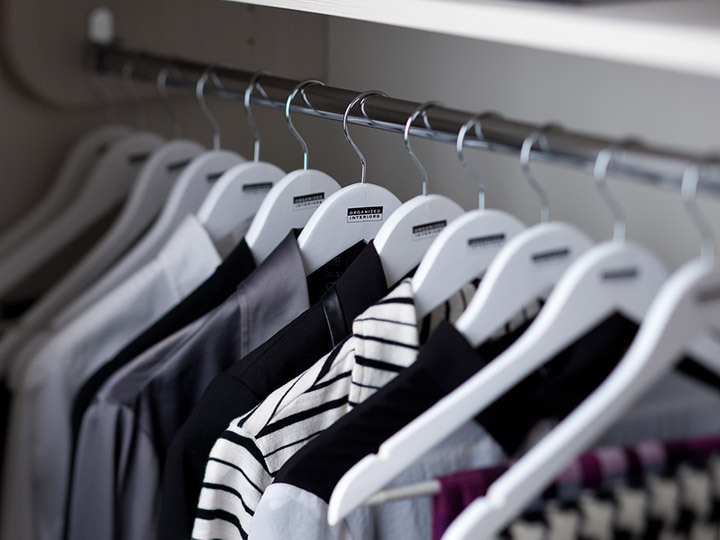 Unless you work in the fashion, retail clothing, or home organization business, there’s a good chance you don’t give much thought to the type of clothes hangers you use. We use clothes hangers every day and stand to benefit from storing our apparel in the best manner possible. That’s why it’s actually rather curious that we mostly don’t pay much attention to what kind of hangers are in our closets. So why is this the case? You might be surprised to learn that it does actually matter what type of clothes hangers you use. The main reason clothes hangers probably don’t quite get the consideration they should is because they’re typically very cheap and easy to come by. Yes, that 12-pack of plastic hangers that only costs a buck at the dollar store might seem like a great deal today. You probably know they won’t be the best quality, but they’re only clothes hangers, right? And all those free wire hangers you’ve gotten from your dry cleaner over the years? Well, why throw out a perfectly functional item? However, it’s worth pondering this – just what kind of quality can those hangers possibly have if the dry cleaner is just giving them away all the time? The truth is, there’s a downside to buying and using cheap hangers instead of relying on a higher quality type, like wood clothes hangers. So as you can see, wire and plastic hangers may be readily available and cheap, but that comes at the expense of the best interests of your clothing. Are all wood clothes hangers created equal? Definitely not. A set of wood clothes hangers being sold at your local store for a tantalizing low price might be better than the thin, flimsy wire hangers you’re currently using, but beware. Both the wood and design quality are the key factors you need to be concerned with. Logically, a harder wood used in the clothes hanger’s construction will provide better strength and durability. The metal head of our hangers is smartly designed with a safety hook to prevent scratching. The hanger shoulders are strong to support jackets and shirts. We also carry thicker hanger shapes to support heavier items of clothing. Notches securely hold straps in place and prevent clothing from falling. Like the hanger‘s shoulders, its supportive cross bar is resistant to clothes slipping and creasing. Our premium hardwood clothes hangers work well for all types of garments and will help you get the most life out of them by providing an ideal storage solution for your clothes. You’ll spend less time ironing out the unsightly creases and wrinkles that can be problematic with inferior hanger types. High-end clothing items (such as an evening gown or men’s formal wear) can cost into the thousands of dollars, so you need to protect your investment. Even a relatively cheaper $100 blouse deserves a suitable hanging home to ensure you’re getting your money’s worth out of it. The mismatched colours of a closet filled with plastic hangers doesn’t add to the space’s aesthetics. Neither does the nondescript look of a bunch of wire hangers. 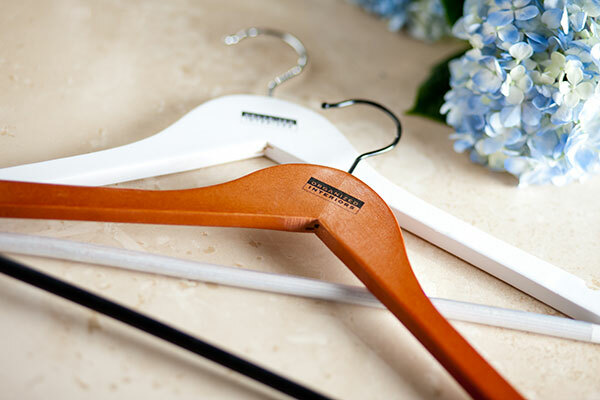 Premium hardwood clothes hangers add a distinct touch of class to your closet space. And while it may seem like a small thing, you’ll also appreciate the cohesive look that’s added to a closet full of identical premium clothes hangers. If you’ve had home improvements made in the form of either a closet organizer or dressing room/walk-in closet, premium hardwood hangers are also a must-have. They’ll nicely complement the upgraded looks and functionality of these transformed spaces. Organized Interiors’ premium cherry and white hardwood hangers. After years of buying clothes and getting your dry cleaning done, it’s inevitable that clothes hanger clutter will become just one more thing you’ll eventually have to contend with. You can minimize or eliminate this problem by simply saying “no thanks” when presented with the option of bringing a free wire or plastic hanger home. The salesperson or dry cleaner certainly won’t mind. It’s a small gesture and the impact on your carbon footprint by rejecting hangers you don’t really need may be minimal, but every little bit helps. Your old useable wire and plastic hangers might be welcome at a thrift store. Plastic hangers (without any metal) might also be recyclable in your blue box. Check your municipality’s recycling guidelines. You’ll prolong the life of your garments by treating them right and hanging them on premium wood clothes hangers. Organized Interiors currently has a special offer that gives you 160 deluxe hardwood hangers for free with a closet or wardrobe order. That’s a $300 value! Schedule your free in-home design consultation to take advantage of this great offer.